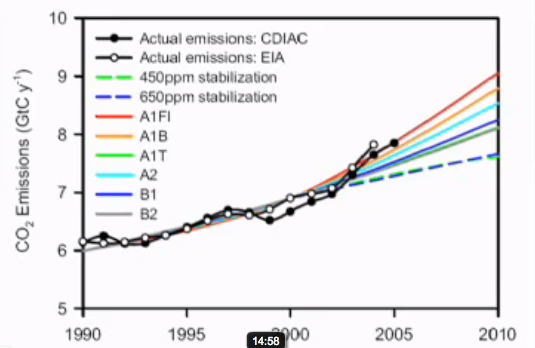 CO2 emissions have raised faster than in the worst case scenarios that were calculated decades ago. Here you have some resources that explain why this is important and what kinds of solutions are being proposed to solve this problem. The film is a drama-documentary-animation hybrid which stars Pete Postlethwaite as a man living alone in the devastated world of 2055, watching archive footage from the mid-to-late 2000s and asking "Why didn't we stop climate change when we had the chance?" Bill McKibben, author and founder of the international environmental campaign 350.org, says that a global campaign to curb climate change, the ecological devastation that will result could make our planet uninhabitable. His appeal to citizens and policy-makers, the sixth video in the series "Peak Oil and a Changing Climate" from The Nation and On The Earth Productions, is a call to action as much as it is a sobering account of the damage we're already doing to our environment. The scientific community has long agreed that our dependence on fossil fuels inflicts massive damage on the environment and our health, while warming the globe in the process. But beyond the damage these fuels cause to us now, what will happen when the world's supply of oil runs out? In a new video series from The Nation magazine and On The Earth Productions, Bill McKibben, Noam Chomsky, Nicole Foss, Richard Heinberg and other scientists, researchers and writers explain. In this sixth video in the series "Peak Oil and a Changing Climate" from The Nation and On The Earth Productions, linguist, philosopher and political activist Noam Chomsky talks about the Chamber of Commerce, the American Petroleum Institute and other business lobbies enthusiastically carrying out campaigns "to try and convince the population that global warming is a liberal hoax." According to Chomsky, this massive public relations campaign has succeeded in leading a good portion of the population into doubting the human causes of global warming. Known for his criticism of the media, Chomsky doesn't hold back in this clip, laying blame on mainstream media outlets such as the New York Times, which will run frontpage articles on what meteorologists think about global warming. "Meteorologists are pretty faces reading scripts telling you whether it's going to rain tomorrow," Chomsky says. "What do they have to say any more than your barber?" All this is part of the media's pursuit of "fabled objectivity." Of particular concern for Chomsky is the atmosphere of anger, fear and hostility that currently reigns in America. The public's hatred of Democrats, Republicans, big business and banks and the public's distrust of scientists all lead to general disregard for the findings of "pointy-headed elitists." The 2010 elections could be interpreted as a "death knell for the species" because most of the new Republicans in Congress are global warming deniers. "If this was happening in some small country," Chomsky concludes, "it wouldn't matter much. But when it's happening in the richest, most powerful country in the world, it's a danger to the survival of the species." Peak Moment 26: Author Guy Dauncey's lively, optimistic solutions for Peak Oil and climate crisis are do-able here and now. Conservation, efficiency, proven technologies, and emerging innovations will take us through this critical planetary energy transition. This article is about the change in climate that Earth is currently experiencing. 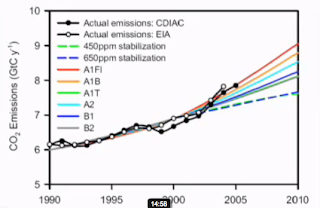 For general discussion of how Earth's climate can change, see Climate change. Global warming refers to the rising average temperature of Earth's atmosphere and oceans, which started to increase in the late 19th century and is projected to keep going up. Warming of the climate system is unequivocal, and scientists are more than 90% certain that most of it is caused by increasing concentrations of greenhouse gases produced by human activities such as deforestation and burning fossil fuels.